I am always amazed – but not surprised – when a patient comes in with foot pain that won’t go away due to worn out shoes. Yes, I know we all get busy. Yes, I know shoes can be expensive. However, let me point out that a typical visit to your doctor will probably cost a lot more than buying new shoes. This patient experienced increasing posterior tibial (instep) pain for more than three months. She regularly does a considerable amount of city/pavement walking, and it never occurred to her that her worn out shoes were contributing to the problem. 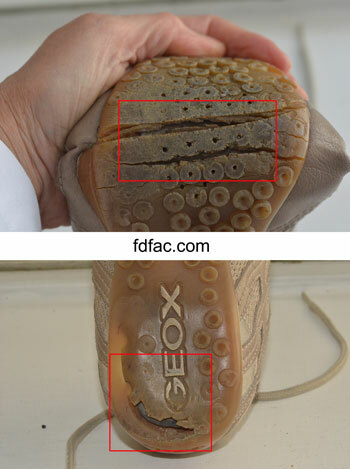 Side-by-side images of the worn shoe and a new shoe illustrate the severity of wear. Similar to tire treads, the outsole of a shoe is designed to prolong wear and protect the less durable midsole. Once the outsole is worn through, the midsole breaks down, changing the way the foot strikes the ground. This image is of a patient who sought treatment for a painful callous on her forefoot. 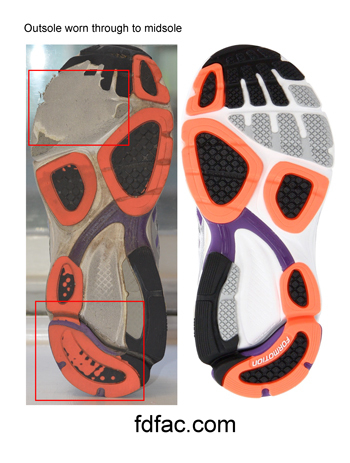 Evaluation of this patient’s shoes showed not only excessive forefoot and rearfoot outsole wear, but actual splitting of the forefoot outsole/midsole. This caused increased weight bearing across the forefoot, and pinpoint callous build up due to the lack of shock absorption and shoe protection in this area. If your shoes are worn, it’s important to replace them. If you’re not sure if your shoes are excessively worn, review my other posts on monitoring and evaluating shoe wear. This is too important to ignore. 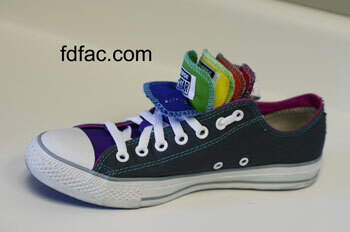 Roller Derby style setter, Admiral DeJenerate, just arrived with her new, custom designed Chuck Taylor’s. Check out the rainbow layered tongues. Customizable options include both blank canvas or graphic editions. How cool to have complete creative control over your kicks design. Added pluses include – affordable cost ($75) and a two to three week turnaround. Visit Converse.com for all the details.